Plot Summary: As little kids, Mizuho had always been the one to look after his cousin and best friend, Enji. Then, Enji had to move and the two lost all contact. 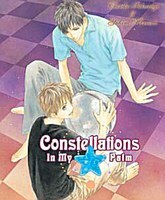 Seven years later, they are reunited when Enji moves in to stay with Mizuho's family, but he seems completely different from what Mizuho remembers - taller, quieter, colder. Now, Mizuho struggles to understand this dramatic change in Enji, as well as his own feelings towards the other man.